Harvest time gives us an opportunity to celebrate food grown on the land. When a crop has grown and is ready to eat, the farmer collects it from the fields. This is known as the harvest. The process of harvesting can vary greatly depending upon the crop and its location in the world. 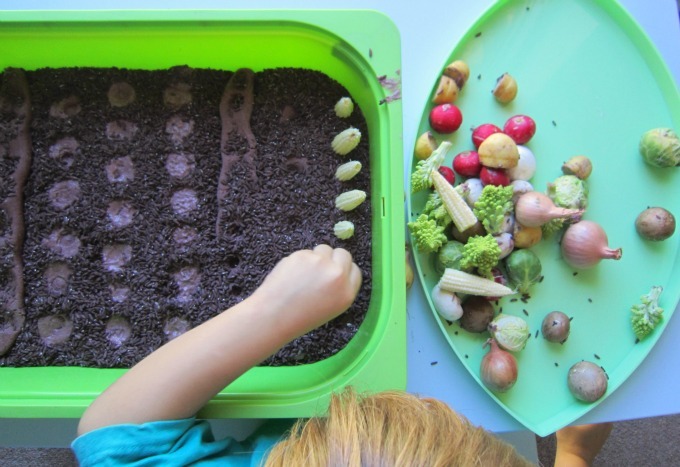 Emma from Adventures of Adam is sharing her inventive Harvest Sensory Bin as part of our Fall Sensory Series to get kids exploring farming and connecting with the food they eat. This post contains affiliate links. Adam and I live in the countryside in the UK. At this time of year, my three year old son is aware of the combine harvesters, extra tractors and machinery around our rural setting. I wanted to make a sensory activity where we could discuss where our vegetables originate from and for Adam to explore the different textures of the vegetables. So we created a Harvest Sensory Bin. Our Harvest Sensory Bin was straightforward to set up. I created a batch of play dough and used brown food coloring to make it look like soil. This was divided into 8 pieces and each section was rolled into a long sausage. I placed the strips of play dough in the sensory bin and pushed them down flat. I inserted a different type of vegetable into each play dough strip. The brown play dough ensured that the vegetables stayed in place. I used baby sweetcorn, shallots, romanesque cauliflower, new potatoes (cut in half), radishes, button mushrooms, brussel sprouts and chestnut mushrooms. To represent the soil around the vegetables I used brown coloured rice. The previous night I poured value long grain rice into a bowl and stirred in brown paint. Once the rice was covered in brown paint, I transferred the rice onto a baking tray covered in baking paper. I left the rice to dry overnight, although it was completely dry within a two hours. The brown rice was then sprinkled into the bin to cover its base and hide the remaining play dough. Our Harvest Sensory Bin was complete. I wanted to use the activity to develop Adam’s fine motor skills so I set out a variety of tools. These included Prepara Super Scoopers, Helping Hands Fine Motor Tool Set, a wooden toast tong, Jumbo Tweezer and Kung Fu Panda Cleverstix – chopsticks for kids. Adam used the tools to remove vegetables from the sensory bin into another tray. The Handy Scooper worked well for the rounded vegetables such as the shallots and radishes. He liked using the toast tongs to harvest the brussel sprouts and enjoyed the challenge of using the Cleverstix to pick up the romanesque cauliflower. Once all of the vegetables had been harvested I had expected Adam to move on to another activity. However, he took a chestnut mushroom and placed it back into the play dough where it had originally been. He repeated this procedure until all of the vegetables were back in the sensory bin. Adam then harvested all of the vegetables again. The counting remained but this time he counted the total number of vegetables – 50 pieces! 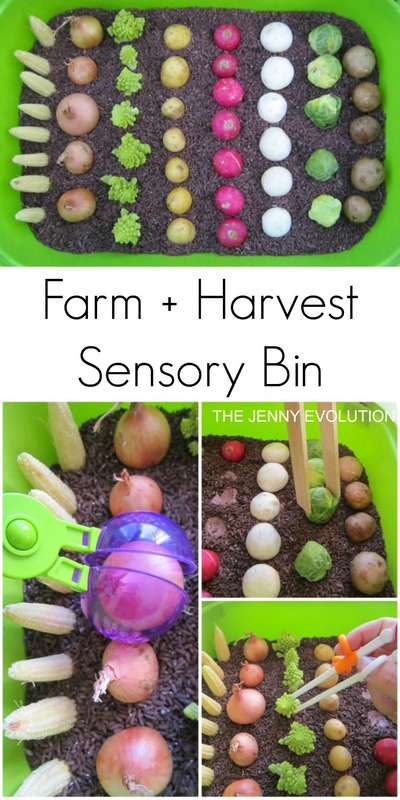 There are a number of ways the Harvest Sensory Bin could be extended. You could use the vegetables to print with and create an harvest inspired artwork. Or the vegetables could be diced and placed in a saucepan to create a harvest vegetable soup. Our Harvest Sensory Bin was a wonderful way to celebrate the fall season. About Emma: During a difficult pregnancy suffering from Hyperemesis Gravidarum (HG) Emma vowed to make every day an adventure once she had recovered. 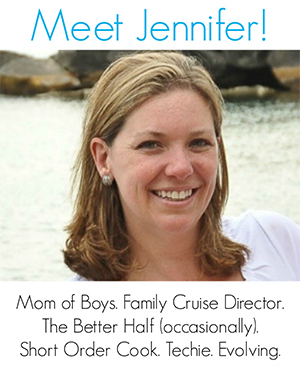 Adventures of Adam is the outcome of completing a 100 day play challenge with her toddler as part of that promise. Emma has a section dedicated to HG friendly play activities so that Mums can still be part of their children’s play whilst they are ill. This is such a cute idea! 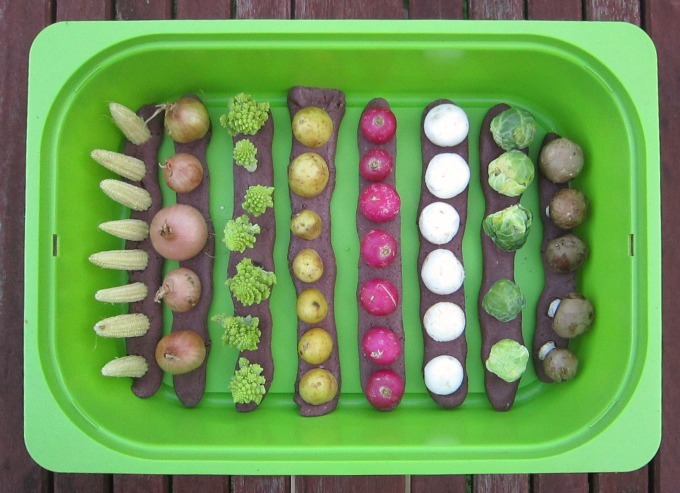 What a fun way to explore the veggies and sensory experience, I think my kids would munch while they play too! I do teacher training workshops. 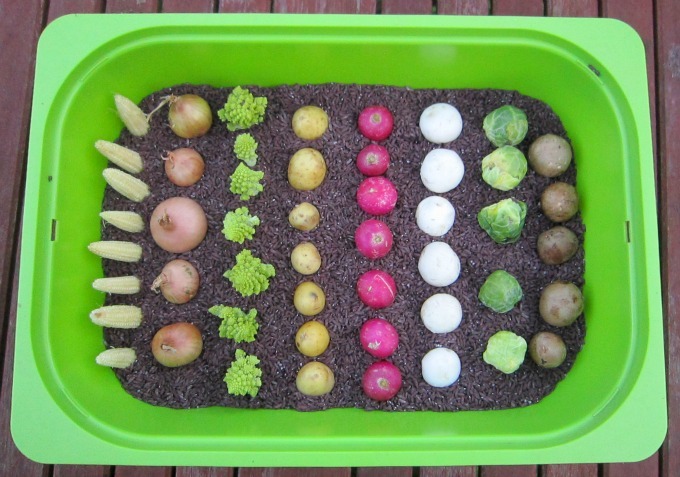 I am writing to ask permission to use the photo of the vegetable sensory bin in a Power Point Presentation. I will credit your site and provide your URL. Thanks for reaching out. As long as you give credit, you may absolutely use the photo in your presentation. I love sensory experiences based around a theme and this one is fantastic! I will have to save this to use with my daughter! Do you have anything for a child that’s sensitive to soft texture food. My son is 16 months and will not touch fruits or veggie if they are soft (avocado, strawberries, banana, etc). He only pick up crunchy snacks and I saw some of your deniers bins idea-they are amazing so I just want to know if you got any suggestions. We started him on solids really late and was puréeing his food and distracting him while he eating so we are trying to change. Thanks for your help! As the mom of kids with allergies, those fruits can also be an allergy trigger (not the fruit themselves, but the pollen the fruit absorbs while ripening). Something to pay attention and see if your child will still eat a food if it’s pureed.